Most Labrador owners travel with their dogs on a regular basis. Whether it’s a daily trip to the park, local journeys to visit friends, or away on a long trip on holiday, you need to know that your dog is safe and secure when you travel. There are lots of options for securing your dog in the car. From seat belts, to harnesses and car crates. Your choice will depend upon your dog, your car and you. So let’s take a look at the options. Where Should Your Dog Ride In The Car? You have a few options for your dog’s position in the car. The front passenger seat footwell, the front seat, the back seat or the boot/trunk. It’s natural to want your dog to be as near to you as possible on a car journey, but this is not always the best choice for your dog. Or indeed for your safety. A dog riding on the front seat of the car is far more likely to be injured in the event of a crash, and to distract you whilst you are driving. While it is tempting to let your dog sleep unrestrained on the back seat of your car, this isn’t the safest way for him to travel either. Many dogs are restless in cars. A large Labrador pacing about and panting in your ear is still a distraction, even from the back seat. He is also likely to be injured, and to injure you, in the event of a collision. However you can buy dog seat belts, which are harnesses to keep your dog controlled when on the back seat. There are pros and cons to these, which we will look at in a moment. Your final option is for your Lab to ride in the back of your car. Secured there in a car crate or by a dog divider. 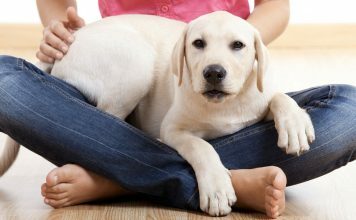 If your Labrador is able to stay calmly in the backseat, and isn’t prone to stress or over excitement in the car, then you might like to try a dog seat belt or car harness. If you decide to use a car harness then you will need to introduce this slowly, getting your dog used to being in the harness and not restricted, and rewarding him for his good behaviour. The Vastar Adjustable Pet Seat Belt is a popular choice for securing your dog in the car. The seat belt has a universal car clip which will fit into your car’s clips securely, and a dog harness clip on the other end. The belt can be lengthened to suit the size of your dog, from 16 to 27 inches, and is 1 inch wide. 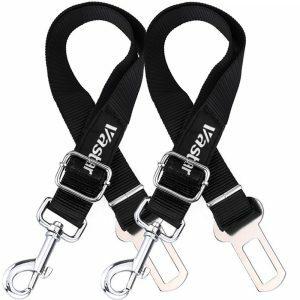 You will need to combine it with a good quality harness to ensure that your dog is kept safe if you have to stop suddenly. Whilst some dogs can be trained to sit still in a car harness, others can find this restriction stressful. Getting themselves worked up, or even tangled in them. The other downside of having your dog riding on the back seat is the mess. 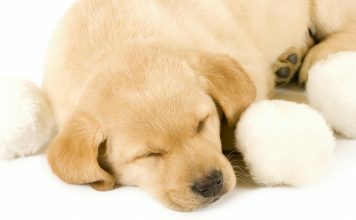 Labradors feet are likely to get muddy and wet on regular occasions. They drool, and in many cases chew as well. Their claws can do a real number on the fabric of your seats, and if you have leather seats can scratch and damage the surface easily. Even with the most laid back dogs. You might therefore like to consider having your dog ride in the back of the car, if your vehicle type has space for him to do so. A dog car divider separates the space between the trunk of the car and the passenger area. It contains your dog, leaving him room to lay down without being able to access the rest of the vehicle. The divider you choose may depend upon the size of your car. There are universal pet dividers available, but still make sure to check the make and model of your vehicle and to measure the area you wish to fit the barrier into before purchasing. 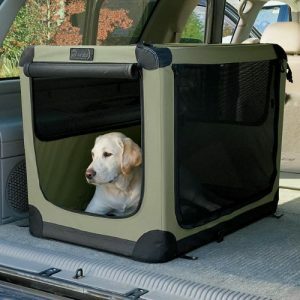 The very popular Highland Universal Pet Divider is designed to safely keep your Labrador in the cargo area. It fits into the car with no fixings required, so is quick to insert and remove. But it is also very durable. The finish has a modern style to it, and the structure is made of heavy-gauge tubing. 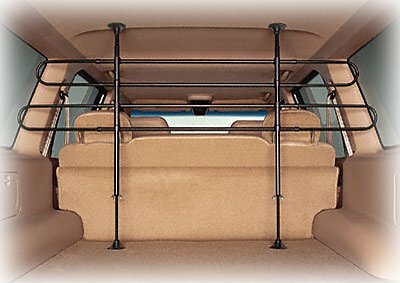 It adjusts up to 45 inches high and 65 inches wide, which will fit most vehicles. The downside of a divider is that whilst it separates your dog, it does not contain them in any way. Meaning it is still possible to accidentally damage the interior of your car, as your dog is free within the space. This is why for many people, a properly designed dog travel crate is the best option. There are a number of options for dog travel crates, and the one you choose will depend largely upon the type of car that you drive. 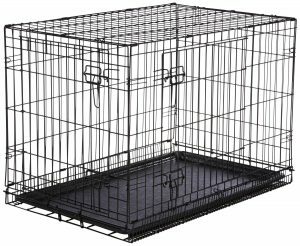 If your car has a large, open cargo area then you might like to buy a traditional wire dog crate to use in the back. They are good value, and if you have a crate at home then your Labrador will be able to have a familiar one to match it. Traditional dog crates come with one or two doors. If you are fitting your crate into a car, make sure that there is a door on the side the will be facing the front of your car. Double door car crates can be slightly more expensive, but you may find one easier to fit into the space available. However, many cars have sloping back windows, which do not allow a traditional style crate to fit within them. That’s where the sloping crates become very handy. Sloping crates are similarly styled to traditional dog crates, but have a sloping front panel and rear panel to fit into your car better. Giving more room for the crate and therefore for your Labrador too. The Trixie Pet Metallic Crate is well constructed, secure and resistant to scratching. The melamine coating on the wood panels will not smudge, and so it will stay looking nice. The crate is framed in aluminum and has tight fitting hard plastic joints. It comes in a variety of sizes, the larger of which will easily accommodate even the largest fully grown Labrador. It is also designed to be quiet in the car, so it won’t rattle and produce a lot of noise like some wire framed crates do. The downside of large, heavy fixed structure crates, is that they can be inconvenient to remove and store. 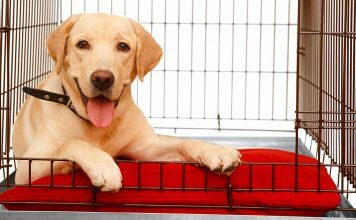 If you want to bring your Labrador’s travel crate out of the car regularly, then you might find a soft travel crate more convenient. 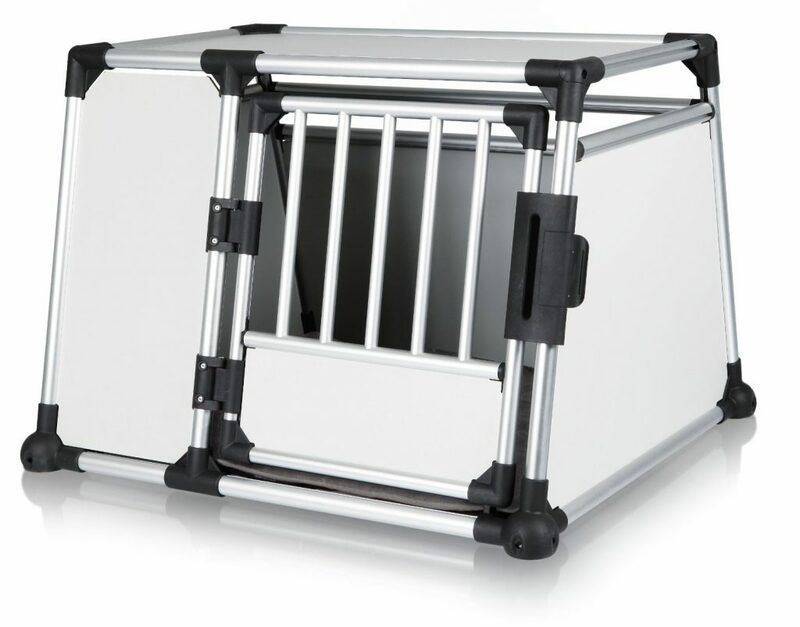 Soft travel crates are light weight, foldable and comfortable for your dog. The Orvis Folding Nylon Travel Crate is easy to set up and take down. This means that as well as being convenient for irregular use in the car, you can if you like re-errect it and use it when you get to your destination. The crate has top, side and front entry doors, and mesh window panels. The base is water resistant, so it can stand up to post-walk muddy paws. Finally you might be interested in using a plastic dog carry crate instead. These are of the variety often used for air travel, and if you travel by car and by plane with your dog they can be a great cost saving choice. 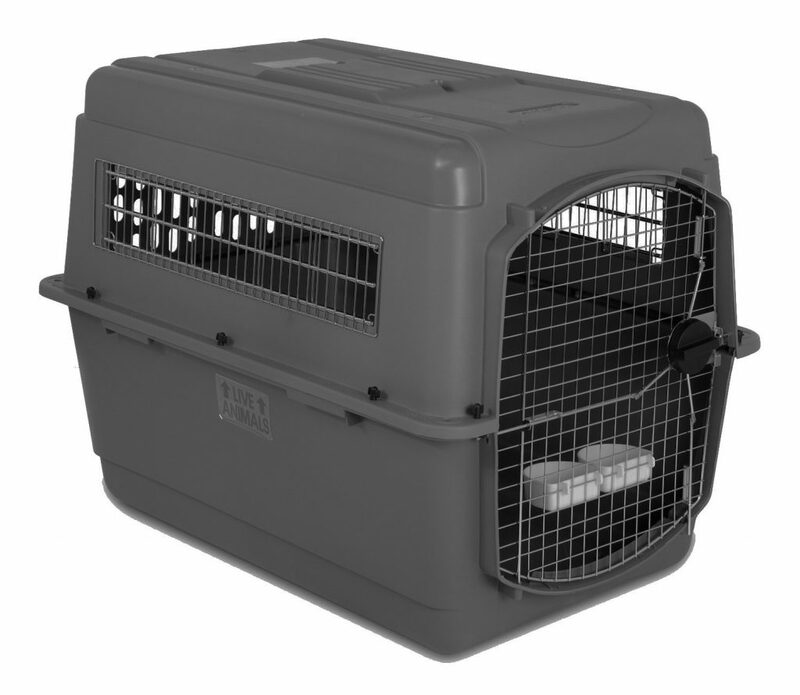 The Petmate Sky Kennel is a heavy duty plastic travel crate. Ideal for long distance journeys, with a secure construction including non-corrosive plastic wing nuts and extra strong steel wire. The door has secure latches, which are easy to operate from the outside. It also has plenty of ventilation points and a door which can be looked out from. It comes in a variety of sizes, and you should pick the one which is at least 3 inches taller than your Labrador, so that he can easily stand up, turn around and lie down without feeling cramped. Should I Buy A Travel Crate, Seat Belt or Divider For My Labrador? 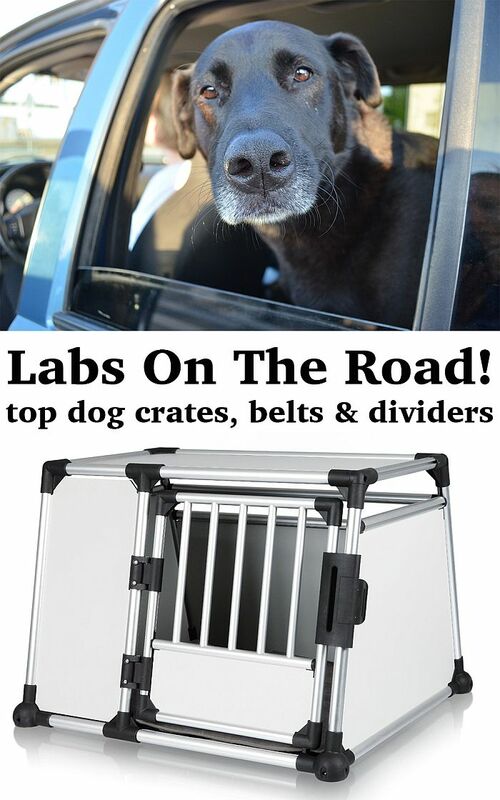 The travel car crate, car divider or dog seat belt that you choose for your Labrador should work for both your mode of transport and your dog. If you have a tiny cargo area in your car and a large Labrador, then gently introducing them to a seat belt and harness is probably the best option. However, for most vehicles the back is the best place for him. 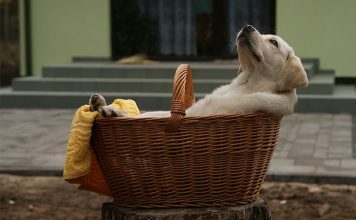 A good travel crate will keep your Labrador safe, secure and happy whilst you take your journey. You might try working with a professional canine behaviorist. That kind of behavior may be why he ended up as a rescue dog in the first place… Also, I’ve been becoming more and more aware of the dangers to everyone in the car of having loose dogs. My trainer was recently rear-ended and her back hatch popped open. If her dogs had not been crated, they would have been loose on the freeway, which is a heart-stopping idea. My only word of caution about putting a dog in the trunk/hatch/way back of the car is the risk of a rear-end collision. We were hit very hard and the back third of our SUV was completely compressed. Fortunately, our lab was in the back seat and escaped the accident without injury. I literally can’t think about the outcome if we had put him in the way back like we sometimes did. He is a back seat dog from now on. 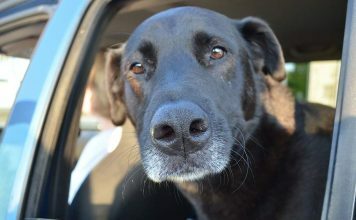 Zac, 4.5yo, 86lb yellow Lab rescue is horrible in the car, but we also have Jess, 58lb 4yo black Lab/hound cross who is quite good in the car. We have a Dodge Grand Caravan with side windows that go down. Currently we have a divider which gives them a lot of freedom in the back but Zac still howls like a police siren and I think he’s just over-excited. I’ve never had this problem with a dog before. We’ve tried everything: lavender oil, partial face mask, harnesses – they all last about 2 minutes in the car. Every day we drive to the park, which is a fun highlight of the day, and still Zac is crazy, and getting worse. And now he’s even bad on the way home! He cannot be crated. I think we just have to suffer and hope he matures – eventually.